This is a laid back family and large group oriented resort located along the Compostela coastline. It has three stone and concrete jetties protecting its two rock and sand beaches. You can fish on all three jetties. The sea floor gradually slopes deeper away from the beach, however the reef wall is looked well beyond casting distance. The bottom is rocky and sandy. You can bring food and drinks into this resort, so it makes a great spot to take the family for the day. Barracuda, Grunters, Emperors, and more. The ones I listed here were what I caught when fishing and what I saw when I did a little snorkelling. There are also some mangroves and a small stream leading to the ocean on the northern side of the resort. ( 8/10 ) This is not a bad place to fish. It is a little bit of a drive from the City through and did not seem to have lots of fish so I give it an 8. I Visited this place with some friends, family and co-workers and was able to bring along some fishing gear. Hooked this nice little barracuda after about five minutes of fishing. 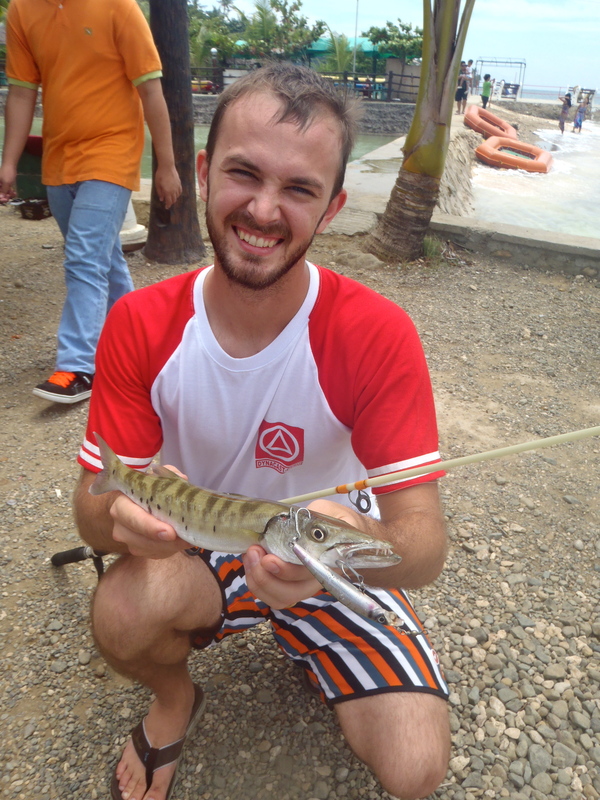 Try to catch the high tide as it goes out to catch barracuda like this and other species. Posted on August 6, 2012, in Barracuda, Fishing Spots. Bookmark the permalink. 3 Comments.